Many people tend to divide aquariums neatly into the saltwater and freshwater types but in fact there are many gradations in between, with every species of fish having its own specific salt level preference. Some fish are happiest in brackish water. What's more, there are several different types of salt which must be properly balanced for a successful fishkeeping experience. What Do we Mean by 'Salt'? Technically speaking, a salt is a chemical compound which can be formed by taking an acid and replacing all its hydrogen ions with metal ions. There are four different types of salts which concern us when it comes to the aquarium: sodium chloride, magnesium chloride, potassium chloride and calcium chloride. Sodium chloride is the one with which you're likely to be most familiar, as this is what we call 'common salt' or 'table salt' - the kind you might sprinkle on your dinner. Sometimes people try to set up saltwater aquariums simply by mixing sodium chloride with water, but this is not enough to sustain marine fish. All marine and brackish water fish need an environment which contains at least some of each of the four types of salt mentioned above. This is because they depend on these salts as a means of obtaining essential elements (without magnesium, potassium and calcium your own body wouldn't work very well either). The balance of salts in the water also affects the absorptive capability of the cells in their bodies. Most marine fish can endure brief dips in fresh water (which can be a useful way to kill parasites), but will become ill if exposed to it for too long. Different species of fish prefer different balances of salts, so if you're keeping a sensitive species it's important to do your reading and adjust the water in your aquarium accordingly. For most fish, however, you can use a commercial product such as Coralife or Seachem. These preparations are carefully balanced to provide your fish, corals and invertebrates with the different salts they need. Besides getting the balance of different salts right, you'll need to determine the best overall salt level for your aquarium - the salinity, or specific gravity, of the water. Ideal salinity is another factor which varies by species. This is one of the factors which determines which species you can keep together in the same aquarium. Commercial aquarium test kits make it easy to monitor the salinity of your aquarium water, and you should do this on a regular basis, at least once a week. No matter how carefully you add marine salts to your aquarium, the level actually present in the water won't remain constant. When water evaporates from the aquarium, salts stay behind, so the salinity of the remaining water will gradually increase over time. This means that when you do partial water changes you may need to add water with slightly less salt in order to get the balance right overall. 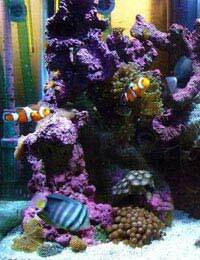 You may find that a white salty layer builds up against your aquarium glass at the surface of the water. This can be carefully scrubbed off and removed. Occasionally fish may bite at this layer because they are attracted to the taste of the salt, but it's not good for them to consume large quantities of it like this. Just as most fish have a preferred salinity level, so do most disease organisms. In many cases, disease organisms are more sensitive than fish, so gently increasing the salinity of the water can kill them off or weaken them sufficiently to let your fish's immune systems deal with the problem. This is even true in freshwater aquariums, when it can be sufficient to use sodium chloride alone for this purpose, though you should always be wary about using ordinary household salt as it often contains additives which could be harmful to your fish. Getting salt levels right may sound complicated, and it can involve doing a bit of arithmetic, but it's fairly easy once you get the hang of it and there are lots of commercial products out there aimed at making it easier still. A proper understanding of how salt works in the aquarium will help you to keep your ecosystem stable and have happy, healthy fish.